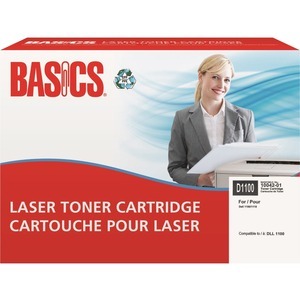 Manufactured at an ISO9002 registered facility using returned, original equipment cartridges. They are Class II level cartridges which means that each unit has been re-charged with both toner and a new drum to ensure top quality output and consistent reliability. They are then tested for quality assurance. Our cartridges can be recycled again and again. Your satisfaction is 100% guaranteed and you can typically save over 20%. Yields 3,000 pages. OEM# 1100. Black. Dell 1100, 1100N, 1110. Contains a minimum of 73% post-consumer recycled content.